When planning a remodel, staying on top of the latest kitchen trends can help you to avoid building a kitchen that will look dated in a few years. "Be faithful to your own taste because nothing you really like is ever out of style." Minimalist kitchens have been making a major surge recently. Simple styles, limited colors, flat planes, and minimal ornamentation describe this recent trend. "Simple and clean" is a common refrain used by our readers use to describe their favorite designs on our social media galleries (you can join the conversation on Facebook). Despite what you might think, minimalist kitchens don't have to be ultra-modern. Below is a traditional kitchen with a minimalist twist: Its monochromatic color scheme speaks of modern simplicity, while the simple moldings and butcher block countertop add a classic style and warmth to the design. 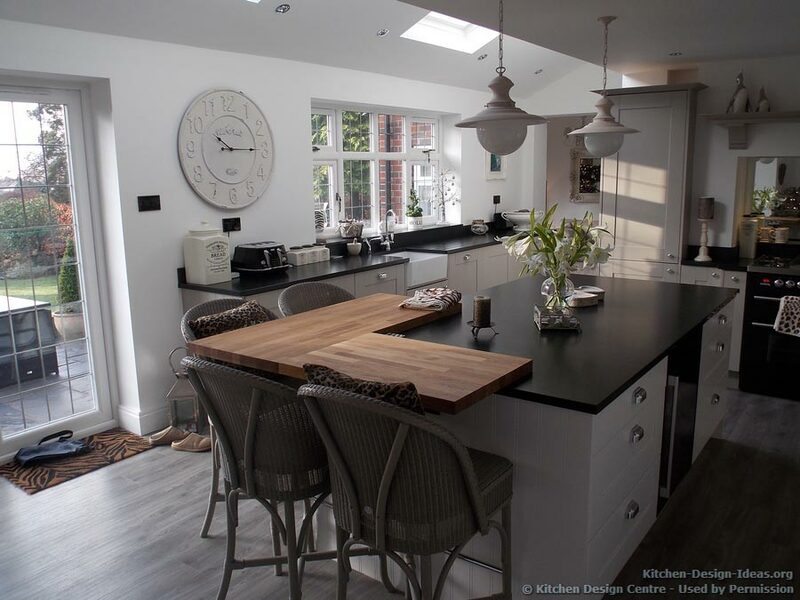 Kitchen Design Trends: In a way that both embraces and transcends seasonal trends, Kitchen Design Centre designed this traditional style kitchen with a minimalist twist. It is possible that the minimalist kitchen trend is a reaction to the excesses of the housing boom, or perhaps just a natural response to the slower economy. Either way, we think a minimalist undercurrent will be here for some time, because such clean and simple designs are usually practical and rarely showy. Both traits are marks of a longer-lasting movement that shouldn't look dated any time soon. Calming Colors: Designer Amanda Lavi sees "quiet" kitchen colors gaining in popularity. Many kitchens are becoming almost spa-like in their color schemes. She describes the color trend as somewhat "beachy": Pale blues, greens, grays, whites, creams, tans and buffs are the colors that her clients have been asking for the most. Dueling Tones: From what we've seen, two-tone kitchens are still highly popular, especially in modern designs. Too much of one color can be either boring or overpowering, so mixing things up with a different color on the island or hood is a great way to keep the space from looking monotone. Kitchen Color Trends: Created by Woodale Designs, this two-tone kitchen features soft white inset cabinets contrasting with a walnut wood island. 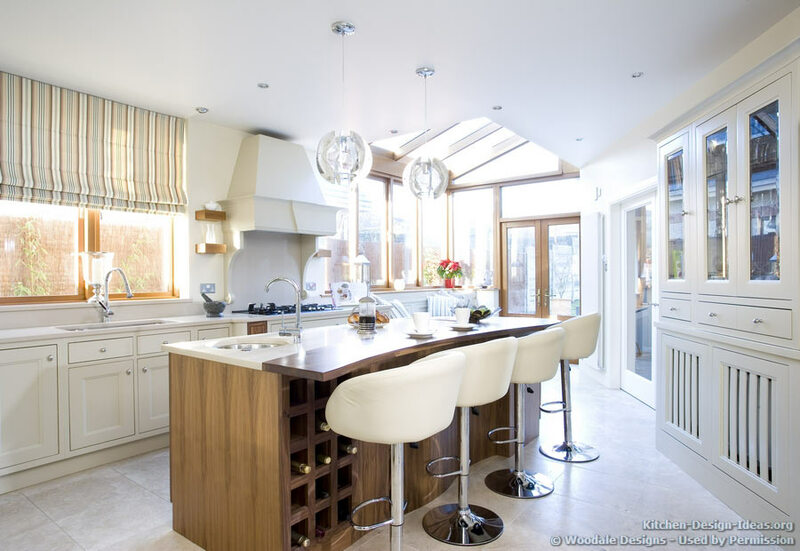 Natural light floods into this luxury kitchen through skylights and windows, illuminating the beautifully balanced design that celebrates both contemporary and classic styles. White kitchens -- even antique white kitchens -- have been steady if not increasing in popularity, often with a wood island for contrast. For wood elements, walnut and cherry wood are popular options in natural finishes. Both wood species have interesting grain characteristics without looking overdone. We recently interviewed Amanda Lavi of RA Design Group in Los Angeles to get her take on current kitchen trends (Designer Interview: Amanda Lavi). Lavi has worked in high-end residential projects, including celebrity kitchens, and she recalls designing kitchens in the past that were ridiculously large. Far fewer people are doing that these days. Luxury homes are still large, of course, but those gigantic islands or even multiple islands are coming down to more practical levels. Having lived in both a tiny kitchen and humongous kitchen recently, I too can testify that there are many efficiency benefits to a smaller work triangle. Walking around an 11-foot island is rather time consuming compared to being able to reach the perimeter of a small kitchen in two quick steps. That said, the kitchen is still the primary gathering place for most families, so larger kitchens aren't going away completely; they're just getting more practical. An open-plan layout, which appears to be an ongoing kitchen trend, is a great way to get the best of both worlds: Guests can gather in the living area near the kitchen, and the cooking area can be more reasonably sized for efficiency. Knock on Wood: Red Oak was a wildly popular hardwood that was overused across America in the 1970s and '80s. Many homeowners are simply tired of it. "Golden Oak," that yellowish brown finish used on Oak cabinets that turns even more yellow with age, is exactly what many folks are tearing out of their homes. The wood also has a tremendous amount of grain that is a bit too busy by today's standards. The early 2000s saw a surge of maple wood being used, probably in part because its grain character is almost diametrically opposite that of Oak. Maple has very little grain by comparison, so in some ways it represented "the opposite of Oak." Subtle Beauty: What I've seen in recent kitchen trends is a swing toward the middle in terms of wood grain patterns, as well as a shift toward more interesting and exotic wood species, especially in modern kitchens. Walnut, cherry, beech, and birch wood continue to be popular. Oak is still used, but in rift or quartersawn cuts that result in straighter grain patterns, completely hiding the sweeping cathedral grain pattern of plain sawn oak so prevalent in '80s kitchens. Kitchen Cabinet Trends: Cherry wood cabinets featuring flat slatted doors create a warm ambiance in this contemporary kitchen. High windows, dramatic lighting, black granite, modern bar stools at the island, and a stainless steel backsplash round out the mix. Cabinet hardware is considered the "jewelry of the kitchen." Weathered nickel, oil rubbed bronze, pewter, and satin nickel are the more popular hardware finish options today. It's usually best to avoid ceramic, glass, or polished brass knobs, as those colors look dated in today's kitchens, unless it is a vintage style that demands it. In contemporary kitchens, many designers are choosing to employ push-to-open mechanisms or long finger pulls along the rim of the cabinets in lieu of handles. This creates a cleaner look in keeping with recent minimalist trends. 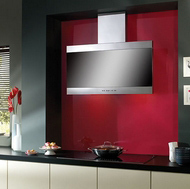 Kitchen range hood maker BEST Hoods reveals five trends for cooker hoods that are destined to be a big feature of new kitchen designs going forward. Another "hot" trend relating to home appliances concerns hot water: Many homeowners are jumping at the opportunity to install a tankless water heater during their kitchen renovation to gain extra space and potentially save energy costs. Read more. 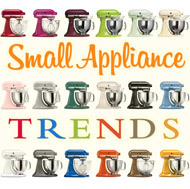 To stay on top of the most current kitchen appliance trends and news, be sure to follow our updates on Twitter. Room Lighting: Gone are the tube fluorescent lights of yesteryear -- those horrendous boxy fixtures that catch flies and leave them on display for all to see through textured plastic. But don't assume that filling your ceiling with recessed lights will absolve you. Going overboard with recessed lights can leave your ceiling looking like Swiss cheese. Instead, if you have a kitchen island or peninsula, or even some clear space over the sink, consider adding decorative pendant lights overhead. These can add tremendous character and dimension to the room, and take the place of one or more recessed lights. For the areas where you do need recessed lights, there has been a slight trend toward 4" diameter fixtures (instead of 6") for a more modern look. 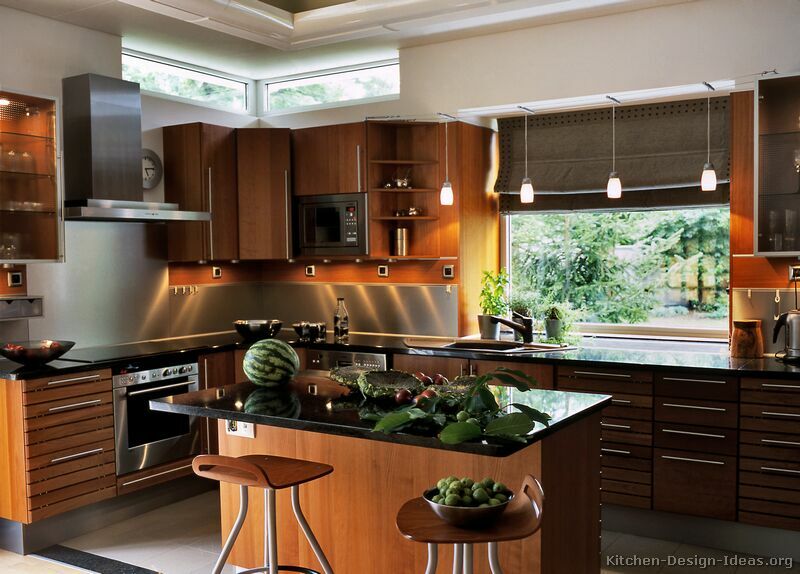 Kitchen Lighting Trends: Fiery pendant lights over the kitchen island add dimension and warmth to this dark cherry modern kitchen by Designer Kitchens LA. Three small recessed lights are situated over the main sink, while under cabinet lights (attached to the bottom of the upper cabinets) illuminate the glass tile backsplash and countertop. 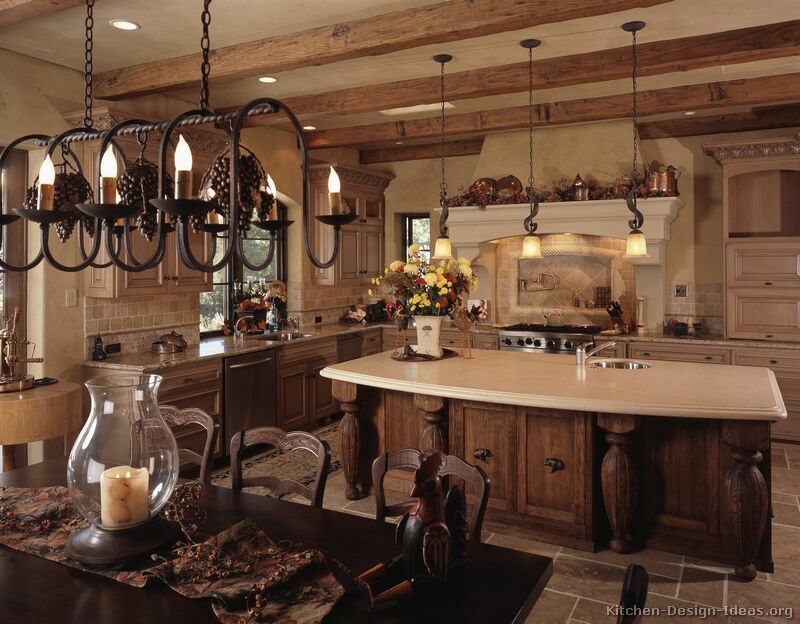 Cabinet Lighting: Of all the kitchen trends we've mentioned, cabinet lighting is one of the strongest. The long-running trend of adding under cabinet lights is still a must-do, along with interior lights for any glass-door cabinets. Some high-end kitchen manufacturers are going a step further by adding in-cabinet lighting to every cupboard and drawer so that the interior illuminates when the door or drawer is opened. A few modern kitchen cabinet makers include lighting strips under the countertop or toe kick for dramatic effect, though you'll want to be careful not to go overboard. Stick to soft lighting to avoid drawing undue attention to those areas. Now that we've discussed cabinets, lighting, appliances, and colors, it's time to step back and consider kitchen trends affecting the overall style and structure of today's remodels. It goes without saying that dropped ceilings and old-style soffits are out, as are most wallpapered kitchens. For ceilings, we've seen a trend toward adding designed elements, including tongue and groove wood planks, box beams, or simple steps in the drywall painted in contrasting colors. Of course, there is nothing wrong with a safe, simple, and flat white ceiling, but if you have the space, don't neglect this potential canvas. Walls are tending to be painted in subdued tones that complement the cabinetry or flooring, typically in lower sheen but not so low as to affect cleanability. Be sure to visit our Kitchen Color Schemes resource page for more inspiration. Lastly, if you have any of the dreaded "popcorn ceilings" (aka cottage cheese or acoustic ceilings) in any neighboring rooms, it's a good idea to have them scraped smooth while remodeling your kitchen. It's sad to see a fresh new kitchen surrounded by rooms that look like the 1970s! Of course, we can't cover kitchen trends without talking about those styles that simply bypass the concept of "trends" altogether. Period styles like Victorian and Craftsman kitchen designs embrace those historic styles that were once trends in their day but have since become classics. Other styles in this category include Rustic, French Country, Old World, and of course, Vintage kitchens. 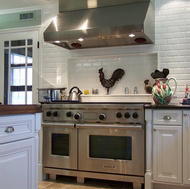 Be sure to read our guide on kitchen styles to ensure that you are choosing the right design for your particular home. Old is New Again: Period styles like this French country kitchen have been growing in popularity as homeowners and designers return to the classic designs of the past. The ornate wood carvings, rustic ceiling beams, wrought iron lighting, and Old World charm give us the impression that this kitchen will stay beautiful for another hundred years. 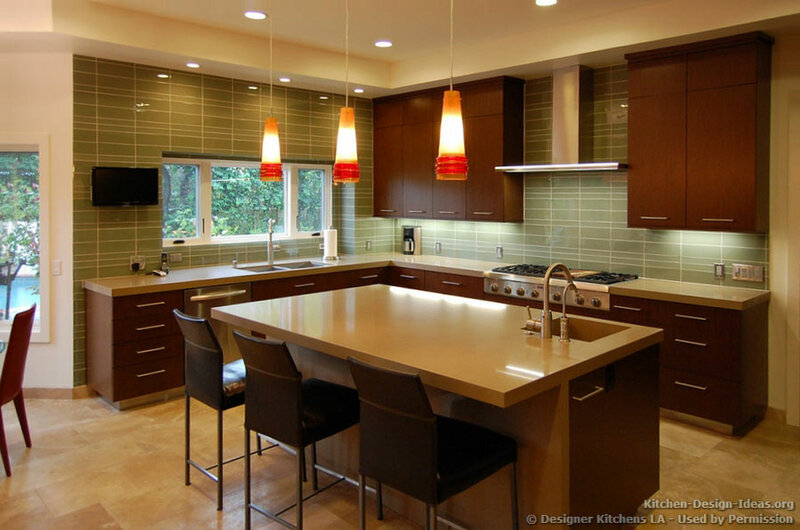 Are you a kitchen designer or remodeling pro? 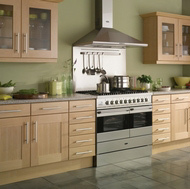 What are your views on where current kitchen trends are heading? We'd love to add your voice to this discussion. Contact us for an interview or leave a comment below. Are you on Twitter? Follow us on Twitter to keep up with kitchen trends as they happen!